As a kid I attended Camp Harlem, a Jewish overnight camp in the Poconos affiliated with the Reform movement. It was a wonderful place and it left an indelible mark on my Jewish future. Yet from the moment I began dating Shira it was apparent how important Ramah was to her and her family. It was not just about the place or the impact, but about the people. It was not until recently that I fully understand the last effect of camp. Many of us and I will include myself in this group, we see camp as an experience that educates our children from afar. For 4, 6 or 8 weeks a year we pay an increasing amount of money to send our kids and grandkids away to a place that allows them the safety to explore and grow in an intentionally Jewish environment. Those young people come home and both love their camp and through it, love being Jewish. It was not until 2 weeks ago that I realized that the unspoken truth of Jewish Summer Camp is its ability to build community. When Seth Rich z”l was senselessly murdered the first people Shira and I heard from asking how they could help the family was his friends from camp. A number of Seth’s camp friends traveled to Omaha for his funeral, one of his bunkmates made the trek from New Jersey to Omaha, for a few hours, to simply make a Shiva call. Why do I bring this up…while it is clear that Jewish Summer Camp creates more engaged Jewish Adults in the communities where they live, it also gives our youth a community that will stay with them for a lifetime. Over the past 72 hours Shira and I, along with Naama and Leor have had the privilege of visiting many of our students attending Herzl Camp and Camp Ramah. Whether it be at Herzl, Ramah, Sabra or the many more Jewish Summer Camps across North America create an intentional educational atmosphere where our children can learn and grow all within a safe and caring environment. Last week I sat in a meeting at the Omaha Jewish Federation, along with other community leaders, to learn about the upcoming demographic study that the community has embarked on. During the info session, the director of the study paused before discussing questions that are asked of respondents who attended Jewish Summer Camp. 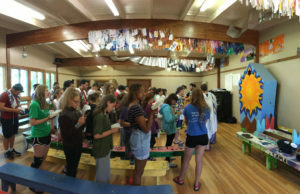 He stated that in all his years of studying Jewish communities it is clear that Jewish Summer Camp attendance translates into greater Jewish engagement as an adult. Now, just because there is a correlation does not automatically mean that camp caused the greater engagement; but the data is overwhelming. On every metric for which we define engagement, those who attended camp score higher, from synagogue affiliation, to lighting Shabbat candles, emotional attachment to Israel to likelihood to donating to a Jewish charity. At the end of the day, camp works. For more information about camp or ways to help support our youth attend Jewish Summer Camp please do not hesitate to be in touch.